When you're planning a grand opening, you want customers and the media to visit your new location. But which types of grand opening ideas can draw the attention of both? We'll show you! While there are no firm statistics, professionals have noticed that the majority of businesses that close within the first two years did not have an official grand opening event. Those same pros continue to surmise that if you create a successful grand opening, you'll set the pace for the weeks and months ahead. This has never been truer than it is today, as we see company after company closing its doors or downsizing. But what can be done for your particular business? Which types of grand opening ideas can draw the attention of customers as well as the media? 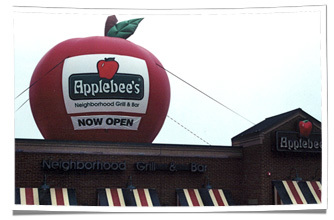 Here's a phenomenal grand opening idea: Create a giant inflatable balloon of your product or logo and place it on the rooftop of your business. For instance, a Mexican restaurant could place a giant, inflatable taco on its roof with a banner that reads, "Now Open." A local veterinary clinic could put a massive, inflatable puppy or kitten on their rooftop with signage declaring, "Grand Opening!" Why giant inflatable balloons? Because they attract attention of all sorts. People busily going about their routines don't even notice most of the advertising that comes their way. According to the Newspaper Association of America, Texas A&M University and the Journal of Concerned Scientists, Americans are exposed to well over 3,000 advertising messages each day from a variety of sources. Our senses are on overload and, therefore, most of the ads we view are blocked out. Likewise, while a photo of a restaurant storefront isn't an overly exciting picture, that massive taco is definitely a photo opp just waiting to happen. Unless you're hosting a sidewalk sale, having a crowd of customers outside your door won't do you much good. You have to bring the people inside your business. Grand opening idea number three is to use smaller, sealed inflatables as giveaways. For example, sticking with the same Mexican restaurant theme, you might say the first 100 customers get a free, miniature, inflatable taco. You could create practically anything you want: inflatable mariachi singers, inflatable sombreros… the list is endless. Because everybody loves to get something free - and because they can be branded with your business name and address - sealed inflatables make the perfect giveaways. As a business, you can't neglect the importance of your grand opening. Use ideas that create a buzz in your community and that will attract the press. When you do it right, you'll find that word-of-mouth advertising kicks in and the business just keeps on coming! Need some creative ideas for your next Grand Opening event? Check out the grand opening inflatables in our online gallery.